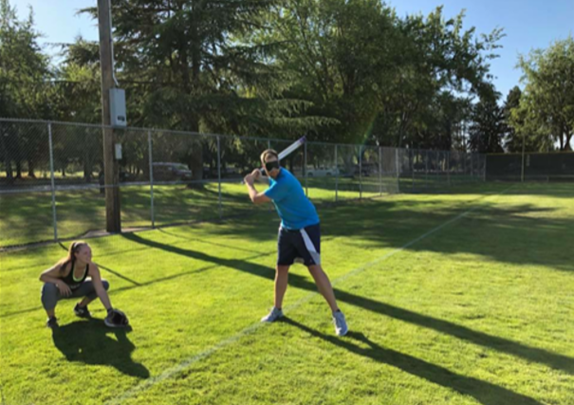 The Kent community is invited to attend a beep baseball game this Sunday, July 22 at 6 p.m. at Hogan Park at Russell Road, Field 3, between the Seattle South King Sluggers and employees from the City of Kent. The Seattle South King Sluggers are a team of blind and visually-impaired athletes. The Sluggers will play against employees of the City of Kent who will be blindfolded and have to listen for the ball and for which base to run to. Nick Deitering, City of Kent Parks Employee, practices hitting prior to the exhibition game on Sunday, July 22. Angie Fealy, from Finance Department, waits for pitched ball. Invented in 1964, beep baseball is played on a grass field with six fielders, a pitcher, catcher and batter. Fielders and batters are blindfolded and, in most cases, are required to be legally blind to participate. The catcher, pitcher and spotters do not wear blindfolds and are usually sighted. The bases are blue tackling dummies that are nearly five feet tall. They have a foamy interior with built-in electronics that make the bases buzz so players can locate them. The bases are placed 100 feet from home plate and are in equivalent positions like in regular baseball. The game is part of the opening festivities of the USA Softball 16A Girls’ National Championship, which will be played at various sporting complexes and ballfields in Kent and Federal Way from July 22 through 28. Players from 18 states and Canada will compete in the girls’ fastpitch softball tournament.